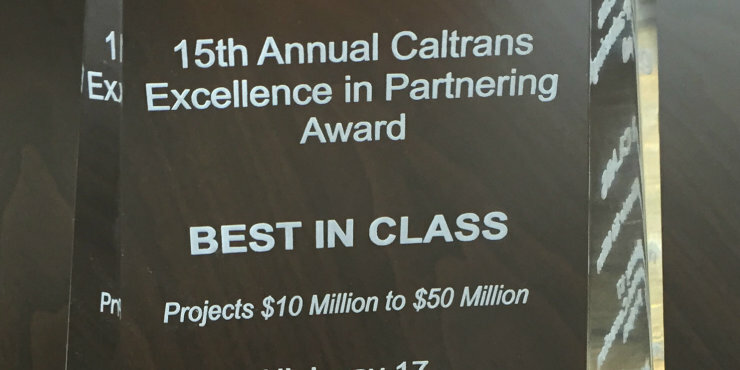 Graniterock is proud to win Best in Class for all Caltrans projects $10 million-$50 million. The Company achieved the state’s gold Excellence in Partnering Award for the Highway 17 wet pavement correction project that started at the summit and went to Los Gatos. 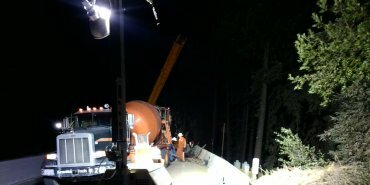 This was a challenging project, done at night, but it was a successthanks to our partner, Caltrans. The work involved buildinga concrete barrier in the medianand addinga slotted drain pipe in the median, as well as many drainage improvements over the edge of the slope. Paul Cianciarulo bid the job, and Eli Mowbray along with Sergio Rubio managed it. Near the end of the job Project Manager Kyle McLean stepped in and completed a sizeablechange order. Area Manager Karl Philipovitch said it was a challenging project, done at night on a busy highway, that involved manychanges along the way. Caltrans and Graniterock worked together to develop value engineering solutions to address the changes and make Highway 17 safer. "This was a win for all of us," Karl said.